Laxmi Narayan Tripathi addressing the gathering at the Diversity Equity Inclusion Future Fluent Global Summit. 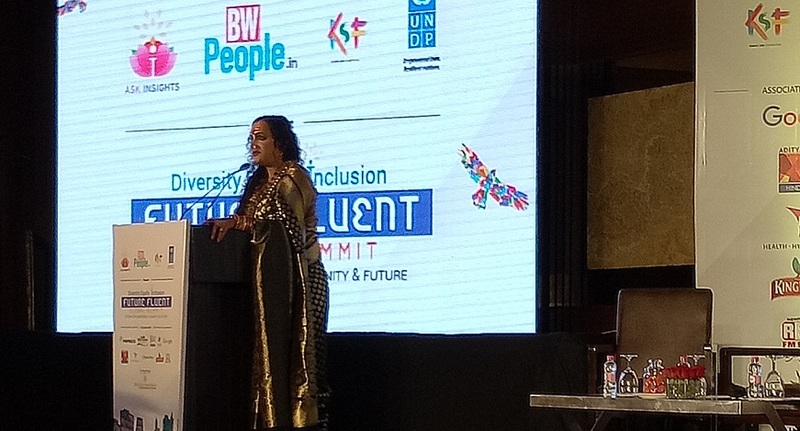 Transgender leader and activist - Laxmi Narayan Tripathi graced the Diversity Equity Inclusion Future Fluent Global Summit, organised by BW Businessworld and AskInsights in the national capital today, with her powerful words and expressed that she wished a normal life with a 9-5 job. “It is my dream that I wish I could work 9-5 and have that experience. I had the qualification and if I had a chance way back when it was my time to join the office, if there was an atmosphere, I believe that what I have achieved in this small life I could have achieved it even at my office desk also. Because it is my capacity to deliver, my work speaks for me not my sexuality” she said. “India has a lot to do and till we don't have non-discrimination policies, I don't think so, we can achieve what we want to achieve”, she added. She also revealed that she volunteered to reform the HR policies of organisations which could bring a change in the work environment but it was all just a ‘big talk’ and nothing was taken ahead. “It irritates me, when we are ready to walk 200 steps but you don't even have the guts to walk two steps with us because it is 10 of the preconceived notions. The stigma is still there within all of us somewhere or the other”, she said. Furthermore she puts light on the education sector and states that change needs to be brought in the dynamics of workplace structure in the country, she said, “Education system is so colonized that we cannot think beyond man and woman. When we talk about inclusion at workplace the spine of the whole thing should be dignity”. She added, “Till we don't educate our own staff, till we don't create that environment in the society at the workplace, till then we won't be successful in terms of inclusion of every gender at workplace”. She exclaims that we have to teach the community and the mainstream society. She also believes that it just takes one step to change millions of lives. Commenting on the summit, she said, “I really believe that such platforms will, at least, force people to have an air of thinking that how you can be more inclusive, how you can contribute from the position what we are sitting to make thousands of life in this country useful, happy and would feel proud of themselves”.